Finally watched Pacific Rim...and while there were any number of things wrong with this movie*, I decided to pick on what I think was the largest, that being the question of the size of the participants in the extra-worldly monster battles, I'm pretty sure that we have a problem here. The basic problem here is that you can't build things that big which move quickly. Now, I could get into a discussion of the Kaiju, as they are far and away the most ridiculous thing about Pacific Rim, but they get a pass due to the fact that they are extra-dimensional engineered beasts(read magic). 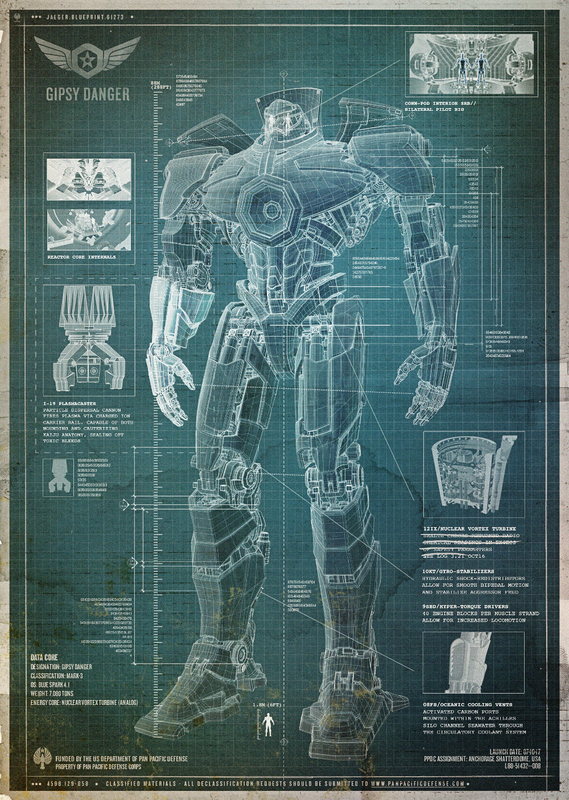 The Jaeger's on the other hand were created entirely with good old fashioned Technology, just like mom used to make. That wonderful beast up above is the movie's main character Gipsy Danger. Unfortunately, many of the technical aspects of her construction were left out of the movie, and have not been subsequently released, but there are a few things that we do know. First off, she stands a towering 79 meters tall, which is about the same as the length of a Boeing 747-400. This is a very tall thing, to put that into perspective, if she stood at the base of Niagara falls, there would still be 28 meters of robot visible above them. Gipsy's mass was also made available to us, and she is a heavy beast, coming in at 1980 Tons of Kaiju fighting giant robot. This is almost 5 times the maximum takeoff weight of the Boeing 747-400 we listed above. The amount of energy required to move this mass is fairly staggering. This brings us to our first question, can Gipsy Danger survive a jump? This would require forces in excess of those used to propel the space shuttle, but that might be able to be accomplished for short periods of time. This is assisted by the fact that Gipsy does not jump in a ballistic manner, but fires some sort of jet out of her back in order to complete the jump. This would allow for relatively possible accelerations. But would the force applied be survivable for an object of her size? Gipsy appears to be able to reach a maximum height of 14 or so meters, assuming that the downward fall is still being slowed by her jets, we can estimate(I just am guessing, but it will give us order of magnitude) that she comes down with an acceleration of 5 m/s^2 giving her a final velocity of 12.1 Meters/Second. Not too fast, about 20 miles per hour. She then comes to rest fairly quickly in about 1 second. This gives a force of about 2*10^7 newtons. So the question is, could her legs survive that much force? It turns out we can solver this fairly easily if we make a few assumptions. First off, let's assume that Gipsy's legs are made of alloys at least as good as steel, and that they have been engineered in such a way that the forces will be applied in such a way that it compresses the steel. Steel is very strong in compression, with a yield strength of at least 500 MPa. Since we know that the force will be on the order of 2*10^7 newtons, how large of a piece of steel would you need to not deform under these circumstances? A quick trip to Wolfram alpha tells us that the steel bar would need a radius of about half the size of a medium pizza! Gipsy's legs are easily larger than this, and could therefor comfortably accommodate such a blow. Now, I know what you are thinking, what about shear forces? Well, the shear strength of steel is much lower than the compression strength, coming in at as little as 1/10th the strength, which means that if Gipsy is ever hit sideways properly, her limbs will fall off, but since that is pretty much what happened in the movie, we'll let that go. The actual scale problem we have is with using the tanker as a baseball bat in the Otachi fight. If you assume that the ship is about the same length as Gipsy, you get an 80 meter ship. I ship of that length might easily mass 400 to 1000 tons(a quick wikipedia search got me these numbers) Realistically, Gipsy's arms probably could handle the strain, though I have my doubts that the ship could, but more importantly, that's like a full grown adult swinging a 50 pound hammer. Gipsy should be pivoting around this thing, not swinging it like a bat. I'm actually forced to admit that this is a bit of a nit pick, but honestly, I had to find something wrong. Overall, they did a shockingly good job with the forces involved with giant robot's, putting Gipsy Danger at just about the right size to be possible, but large enough to be suitably epic in scale. Giant robots fighting alien extradimensional monsters is a wonderful thing, but please don't use ships as bats, especially when you have awesome chain swords. It's silly. Although Kevin Durant was a member of the Texas Longhorns, the Duke Blue Devils has received a special variation of the Nike KD 9 PE for the upcoming season.Essentially covered in the university’s signature Kobe 8 colors — black dominates its flyknit upper, while royal blue accents are prominent on the inner lining, laces and midsole unit. Finally, contrasting white Nike Zoom Kobe Icon accents adorn the Swoosh and KD logos, as more respective branding is seen on the heel pull tabs.It’s uncertain if this rendition of the LeBron soldier 9 silhouette will be available to the public, but, stay tuned to KicksOnFire for more updates. The next variation of the popular Nike Air Kobe 11 Foamposite Pro is set to be offered in Hyper Cobalt once again this summer.A former Ben Gordon-exclusive colorway, the popular basketball sneaker is essentially KD 7 defined by its eye-catching blue tone across its rugged foam upper and outsole. Tonal accents of black converges along the leather eye stays, laces, Kobe 6 tongue, inner lining and glossy Swooshes to perfectly offset the vivid tone, while the model is rounded out with its signature carbon fiber shank LeBron 12 on the midsole. Furthermore, the miniature Swooshes across its toe section, heel tab, as well as the insoles, are rendered in the defining hue Kobe 10 to blend with its respective color scheme. To go along with the recent “White” pair we shared, we now take a look at the other Air Jordan 5 Premium Jordans for sale “Take Flight” Sample.Unlike the retail version of the Air Jordan 5 “Take Flight” that’s set to debut in February. This Air Jordan 5 has a few slight differences from the two. Built with a premium leather upper with Jordan 1 the Flight lace lock, and added speckles on the shark teeth of the midsole.Don’t expect to see this Air Jordan 5 Premium “Take Flight” Sample release anytime soon, but the “White” pair might see a debut sometime in Jordan shoes 2017.Take a look at the additional images of this sample below and we’ll keep you updated with the latest as it develops.